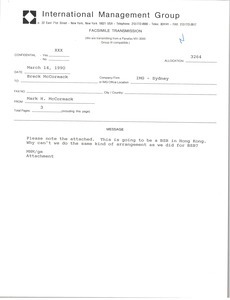 Hong Kong - Concerning the Hong Kong cable television idea, Mark McCormack reiterates that it would be "great for us to have a BSB type of contract." 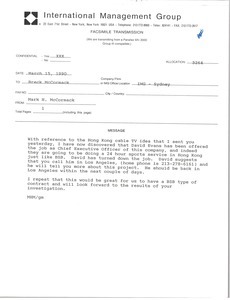 Hong Kong - Concerning the attached article about Hong Kong Cable Communications, entitled :Help wanted: 500 TV executives" from Electroniv Media on February 26, 1990. Enclosure not scanned.